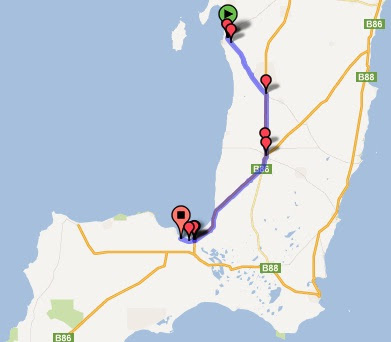 We covered alot of ground today and we are now at the foot end of the Yorke Peninsula. The caravan park last night was crowded and cramped but nice enough. The hot weather remained for most of the afternoon and also into the night. But fortunately it clouded over but the breeze was enought to cool things down. In the evening we went down to the jetty and it must have been around high tide as the locals came out to catch squid. One guy near us caught 2 in about 1 minute ... he was a happy chappy! There was alot of locals out swimming throughout the afternoon and early evening. We went to bed around 9pm and no sooner had we turned the light out when some 'dickhead' decides to arrive and set up camp ... and right next to us. They were trying to be as quiet as possible but with the constant moving of the car, rattling of their 'Taj Mahal' tent and then blowing up their air matress with a damn noisy compressor ... it wasn't making it easy to sleep so I didn't nod off until around 10.30pm and it wasn't a great nights sleep either. We woke early to get an early start as we expected strong headwinds today. But once we got started the wind wasn't around at all! We took the quiet road to Minlaton and this joined the main Yorke highway about 17km before Minlaton and believe it or not this must be the last remaining road in Australia NOT to have been widened. The majority of roads around Australia have been widened for the increase in width of trucks and caravans but this road hasn't so a truck and a caravan can just fit in their lanes ... LOL it is wonderful to watch because when they pass each other they get the wobbles for fear of going of the road! We took a break at Minlaton and had a cuppa and picked up supplies for the next 2 days as we are having a rest day at Point Turton. This plane is called the Red Devil and was flown by a chap called Harry Butler and it is a Bristol Mono plane ... if you require any additional information about this plane please contact Raymond Jones in Colac, Victoria! From Minlaton the road goes in a south west direction to the coast by now the wind is blowing a little but not very strong but enough to remind you that you have a little resistance. We arrived at Point Turton and there is a munter of a grunter of a steep short hill to get into town and then you ride along the main road to the end where the caravan park is ... Now Point Turton is a little dot on the map but there is a huge amount of houses here, particularly new ones and a great deal of them are retirement homes and since there are no builders around they all come from Adelaide so it can cost around $500,000 for a home and even more with an ocean view, but obviously everyone doesn't mind paying it as there are lots for sale everywhere. LOL he looked quite comfy up there on his perch. The caravan park is small but not cramped or crowded, in fact this is very much an unknown caravan park that has alot of regulars that come here - this park celebrates Melbourne cup day and has a bbq and regulars come here every year for it. This is probably the best caravan park between the 2 peninsulas and it doesn't charge the earth for being so close to the sea - only $23 powered off peak and on the weekends it is a little more. We came here because it was a park with a reasonable distance from Port Victoria and everyone keeps asking us how did we know about this park ... we simply say the internet. Basically they can't believe that we know about this place ... which is strange - maybe they don't realise that we basically stay at nearly every caravan park on the peninsula because of the distances!